Now that there are no sew projects, there is no excuse not to have the prettiest tablecloths and napkins around! When the seasons change, it’s nice to do a couple things around the house each month so your home changes along with nature. Even in this Florida home, where yellows and peach-tones prevail, a darkening of those hues into the browns and olive greens can bring a bit of the northern fall atmosphere anywhere you use them. Slip covering pillows, adding throws and dressing your dining table in them is another perfect location. To make a lovely fall dining table ensemble that includes two table cloths, a round and a square, coordinating napkins, and even new seat covers, just follow along! And, the best part of all these projects is that they are all no–sew! I should have added (and plenty of time) to the materials list. I noticed that it took me quite a bit longer to make the tablecloths and napkins as no-sew projects because of the wait time with the ironing. For those of you who don’t sew, this doesn’t really matter, but sewers may want to consider dragging out the old sewing machine! 1. Measure, Measure, Measure. To make either a round or square tablecloth, you start out the same way. Measure the table. Ours is 54” in diameter. If it was square I’d measure from one side to the other. Then, determine the “DROP” you want. I felt that I wanted the table cloth to just touch the seats, so my drop is 12”. So I add 54” plus 12” and another 12” on the other side of the table for the drop. This means my finished round table cloth needs to be 78” in diameter. 2. Piece Together the Width. Most fabrics come either 45” wide or 60” wide. Mine was 45” so I knew I would have to add pieces to both sides of the main panel to cover the table and create the drops. The first thing I did was to cut two lengths of fabric at 80 1/2” inches. That is the 78” in diameter plus a 5/8” hem all around. Then, I added equal size pieces to both sides of the main panel, enough to give me 80 ½”. So a couple of 45” wide pieces, one cut in half lengthwise, and attached gives us just enough. 3. Iron it Together! To attach the side pieces when you aren’t sewing requires iron on adhesive. I used two different versions of this and I like the “Steam a Seam” best. 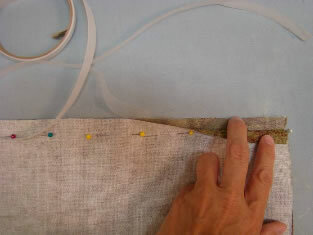 Just pin along the seam line, parallel with the edge of the fabric instead of the normal perpendicular for sewing. 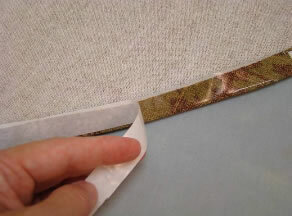 Pull the paper off the adhesive strip and insert it into the seam area. Adhere it to the bottom selvage and then close the selvage by putting the opposite selvage on top of the adhesive strip. 4. 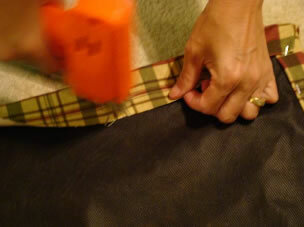 Then start ironing the seam closed, gently, on a wool setting. You may want to pull the pins out as you go. I must admit I did melt a couple of the heads off! Just keep working in this fashion until the seam is glued shut. First timers who haven’t worked with matching patterns might consider using a solid color or something that doesn’t require a pattern match for better results. 5. Do It All Over Again! I used iron on adhesive to connect both seams and then I went a step further and glued the seams down flat with additional iron on adhesive so they would always stay neat. 6. Round or Square? Now here’s the separation between a square tablecloth and a circular one. For square you’re all set, just glue in the hems using more iron on adhesive, all the way around. 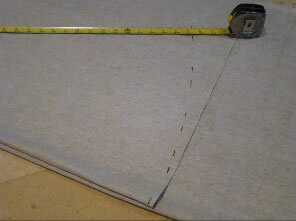 For a circular tablecloth, fold the fabric in quarters, and get out the tape measure. If the diameter of your unhemmed tablecloth is 80 ½” like mine was, you measure 40 ¼”, half the dimension, from the corner out, and make marks in a circular design until you’ve covered the quartered piece of cloth. 7. 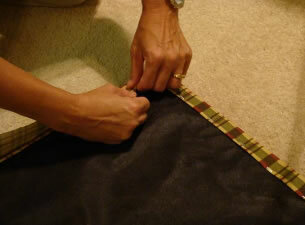 Cut along the line, unfold the tablecloth and continue by gluing in the hem all the way around. And the hem goes in best if you first iron in the 5/8” fold up and the second 5/8” fold. Then, insert the iron on adhesive like before and iron all the way around. The napkins are a cinch. Just cut fabric 2” larger than you want your napkins. 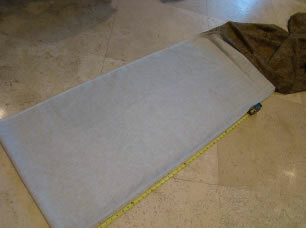 Some are 18” square and others go up to about 22”. 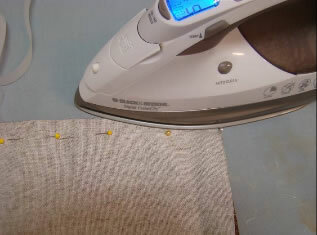 Iron in your ½” hems, insert the adhesive and iron around again. They come together very easily. Like napkins, this project is easy as pie. You’ll need to add an electric staple gun and cordless driver to the materials list for this project. 1. The Undoing. Start by turning your dining chairs upside down and locate the four screws that are holding the seat onto the chair frame. Unscrew the screws and remove the seat. 2. Cut and Staple. Cut the new fabric several inches larger than the seat so you can lay the seat, fabric side down on the wrong side of the new fabric and fold the new fabric around the seat. 3. Staple one side first then go to the opposite side and staple so you can pull the fabric evenly and taught. Move onto the other opposite sides and finish with the corners, stapling the new fabric to the wooden seat form. 4. The Redoing. Return the seat to the chair frame and screw it back into place. Easy-peasy huh? Now, take some time and put your table together. 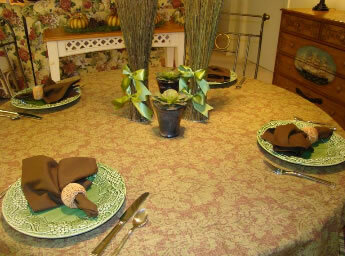 Use one table cloth or layer the two with the circle as the base and the square as a topper. 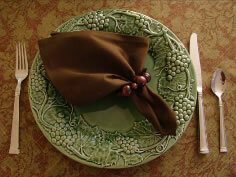 Add dinnerware and your brand new napkins. 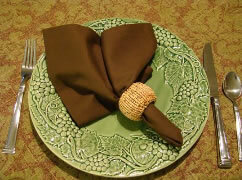 Don’t forget the details too, remember, there are all sorts of options for napkin rings for the fall. Of course woven is great all year long and its texture is perfect for getting that added cool weather warmth! 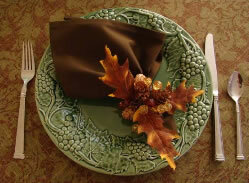 How about wrapping the napkin with a sprig of fall foliage? Or maybe beads that you string on elastic? These are a great craft project for fall, or you can find them in just about any home décor store. My personal favorite is to use fall wired ribbon. It is fairly inexpensive and of course very easy to make on your own! 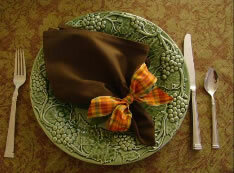 Finish the table off with a lovely fall centerpiece and you’re set until the holidays! !